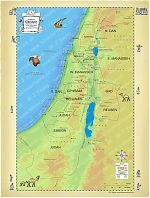 Bible Maps are presented below in Bible Book order (Genesis, Exodus, Leviticus… Revelation). Within each book, they are presented in Chapter order (eg Chapter 01, 02, 03, etc). Click on map or text inside box to see/buy map.